With 21.3 million people classified as refugees worldwide, it has become hard to conceptualize the human toll of the Syrian Civil War and other schisms in a post-Arab Spring Middle East. So when Mark Storella, father of Théo Storella ’20, talks to people about the global refugee crisis, he makes sure to emphasize the fundamental similarity that lies at the core of the human experience. 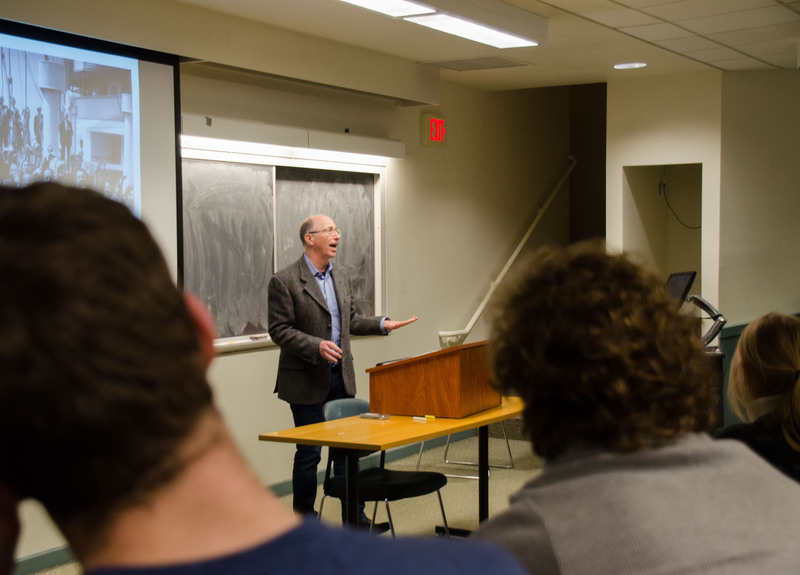 The Wesleyan Refugee Project and Allbritton Center hosted Storella, the Deputy Assistant Secretary of the U.S. Department of State’s Bureau of Population, Refugees, and Migration, on Thursday, March 7 in PAC 001. The talk, entitled “Migrants, Refugees, and the International Community,” allowed University students and faculty to garner an insider’s perspective into the policies the State Department is considering to manage the global refugee crisis. Storella’s commitment to refugee assistance runs deep. In 1983, while attending the Fletcher School of Law and Diplomacy at Tufts University, he joined the Fletcher Refugee Project, which resettles displaced people in the Boston area. Storella has also worked with refugees in Africa, and was impressed by their concept of “ubuntu,” which refers to the humanity of others. Prior to his current assignment, Storella served as the Deputy Chief of Mission at Embassy Brussels and was the U.S. Ambassador to Zambia from 2010-2013. During his lecture, Ambassador Storella traced the history of the humanitarian movement following the Enlightenment and the migrant crises after both World Wars. He recounted the origin story of the International Red Cross Movement, which was formed after Swiss-man Henry Dunant surveyed the results of the gruesome Battle of Solferino in 1859. With the help of wealthy patrons like Florence Nightingale and Clara Barton, Dunant became one of the leading figures in a growing global humanitarian movement. Storella compared this history to urgent questions concerning refugees and displaced people in the 20th century, which culminated in the Refugee Convention of 1951. The Convention helped shape the international laws and institutions that govern the treatment of refugees. “The contract between individuals and their government should be based on the idea that they give up some of their rights in return for protection,” Storella said, channeling Western social contract theory. Striving to draw a visceral connection between the plight of Syrian refugees and Jews fleeing Nazi-occupied Europe, Storella showed the audience a picture of the infamous M.S. St. Louis boat. In 1939 the boat, filled with Jewish refugees fleeing Nazi Germany, nearly hit the coast of Florida before being turned away and sent back to Europe. Many of the passengers ended up dying in internment camps. He connected the plight of the St. Louis passengers to the movie Casablanca, and its deeper message about the marginalization of displaced people. Storella believes that the global refugee crisis, which has displaced over sixty million people, broke through the national consciousness after a photo of Syrian child, Alan Kurdi, went viral in 2016. Laying facedown and motionless at the edge of the coastline, Kurdi’s tragic fate resonated in the minds of Westerners who, until that point, had largely avoided drawing a personal connection to the fate of displaced people. Recounting his own experience with refugees, Storella identified with the pain of a Syrian father who had just lost his son, as he continues to raise his own children. With President Trump calling for the implementation of “extreme vetting” for refugees, one critical moment of Storella’s lecture occurred as he attempted to clear up any misconception that audience members may have about refugee vetting, a two and a half year process. In 2015, 107,100 refugees were officially resettled, 70,000 of them in the U.S. For the millions more who have poured out of places like Syria, the burden often falls on countries like Kenya, Zambia, and Tanzania, who do not have the resources to manage the influx of displaced people, NGOs, or international organizations. Storella also praised President Angela Merkel for displaying extraordinary leadership by taking in 800,00 asylum seekers over the past few years. Still, with Kenya considering closing camps and prematurely sending Somalian refugees back to their homeland, the U.S. government must continue to adapt to deal with these challenges.